Like other artists who travelled to South America, Heade was profoundly impressed by the fertile lushness of the tropics. His first paintings of hummingbirds date from 1863 in Brazil. Later, in 1870, following a trip to Panama, Colombia and Jamaica, the artist conceived of the idea of combining hummingbirds and orchids. 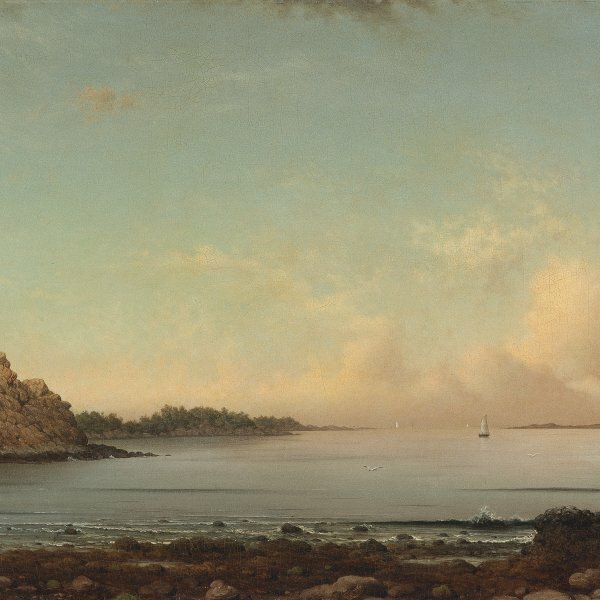 The originality of these works, painted by Heade in his studio, lies in their fusion of still life and landscape, resulting in an overall dramatic effect. 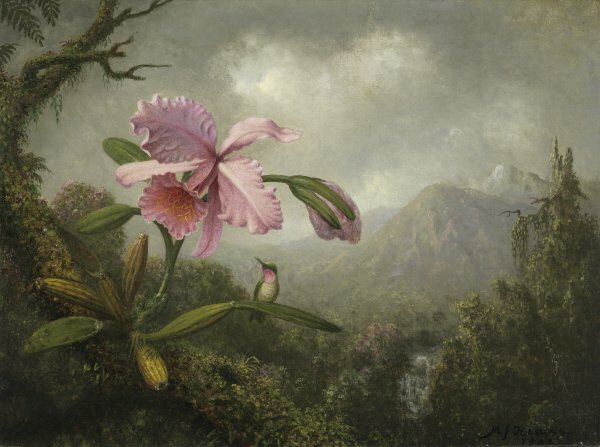 The juxtaposition of birds and flowers was common in ornithological illustrations but in works such as Orchid and Hummingbird near a Waterfall Heade made use of one of the most striking varieties of orchids, the pink Cattleya labiata, placing it so close to the foreground that the petals seem almost flattened. The small hummingbird creates a dialogue with the flower through the position of its head and the amethyst tone of its throat. In the background a verdant landscape emphasises the sensual and emotive power of the composition. Heade's pictures of hummingbirds in combination with orchids (or occasionally passion flowers) arguably stand as his most significant contribution to the history of art. They represent an amalgam of his impressions of the tropical world: the birds he studies in Brazil in 1863-1864 and the flowers that captured his imagination on the island of Jamaica six years later. Visually dense and iconographically complex, they weave together Heade's responses to contemporary science, art, and tropical America, which continued to engage him through his last years. This canvas was painted in 1902, when the artist was eighty-three years old, two years before his death. In contrast to most artists, whose later years are often characterised by a decrease in activity and a certain repetition of earlier motifs, Heade's career had a different trajectory. For in 1883, at the age of sixty-four, he bought his first home in St. Augustine Florida, married for the first time, and found his first sustaining patron in the person of Henry Flagler. He began to paint the Florida swamps -striking for their affinity to his favoured regions of Central and South America- and continued to essay his still life and orchid and hummingbird pictures. Orchid and Hummingbird near a Mountain Waterfall is a fine example of this genre, where the artist demonstrated his inventiveness by combining an enlarged and commanding foreground flower with the hummingbird before a tropical mountain setting. Heade's fascination with hummingbirds offers a key to his pictorialization of Latin America. "A few years after my appearance in this breathing world", he wrote, "I was attacked by the all-absorbing hummingbird craze and it has never left me since." In order to see most of the families approximately 320 members one has to travel to equinoctial America, where they make their home. And so Heade determined to go to Brazil, where he would study the bird in its natural habitat and prepare the illustrations for an intended book entitled The Gems of Brazil. Although the book was never realised, the project lived on in the many canvases in which he depicted them singly or in pairs. The loving detail with which he delineated the hummingbird in this canvas of 1902, when his memories of Brazil had long faded, can be attributed to his observations of the hummers he tended as pets during his Florida years. Every aspect of these pictures-the birds themselves, the profusion of tropical vines, and the overripe orchid blossoms-conveys the vitality he sensed in these unique creatures and in their Brazilian forest habitat. They represent the artist's meditations on the question of the origin of life. 19th century viewers prided themselves on familiarity with the language of flowers, in which different varieties of blossoms were interpreted symbolically. Roses, lilies, nasturtiums all had their associations spelled out in books such as Flora's Lexicon. The orchid, however, is conspicuously absent from these publications, suggesting that its associations with sexuality were best left unspoken. The boldness of Heade's composition, in which the orchid's soft pink petals are pressed against the picture plane, is even more pronounced when seen against this context of Victorian America.